Campus Advantage purchased The Highlands, a 732-bed property in Reno, Nevada in 2015. At the time of the acquisition, there were not many properties in the Reno market. 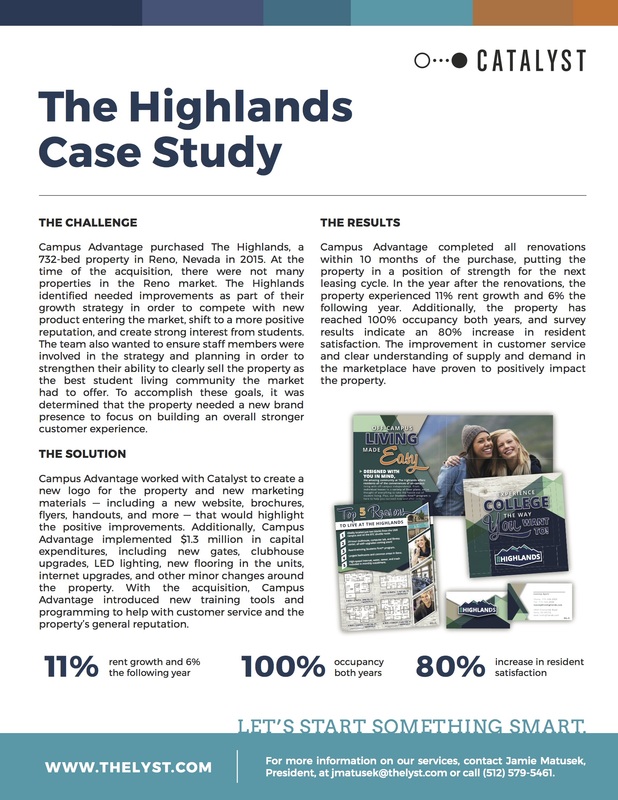 The Highlands identified needed improvements as part of their growth strategy in order to compete with new product entering the market, shift to a more positive reputation, and create strong interest from students. The team also wanted to ensure staff members were involved in the strategy and planning in order to strengthen their ability to clearly sell the property as the best student living community the market had to offer. To accomplish these goals, it was determined that the property needed a new brand presence to focus on building an overall stronger customer experience. Campus Advantage worked with Catalyst to create a new logo for the property and new marketing materials — including a new website, brochures, flyers, handouts, and more — that would highlight the positive improvements. Additionally, Campus Advantage implemented $1.3 million in capital expenditures, including new gates, clubhouse upgrades, LED lighting, new flooring in the units, internet upgrades, and other minor changes around the property. With the acquisition, Campus Advantage introduced new training tools and programming to help with customer service and the property’s general reputation. Campus Advantage completed all renovations within 10 months of the purchase, putting the property in a position of strength for the next leasing cycle. In the year after the renovations, the property experienced 11% rent growth and 6% the following year. Additionally, the property has reached 100% occupancy both years, and survey results indicate an 80% increase in resident satisfaction. The improvement in customer service and clear understanding of supply and demand in the marketplace have proven to positively impact the property.